Edge conducts the majority of its business at trade shows where wholesale buyers walk around stalls and pick out prospective products. 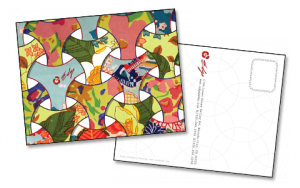 We require two postcard designs that will be free to the buyers and help them remember the Edge line of products. 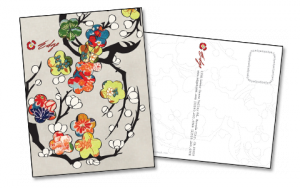 The postcards must be of final size of 5-3/8 x 4-1/8" and exemplify the Edge style of material products. The uniqueness in Edge’s style is the revival of old world flower patterns, on the material used, fused with new world design. 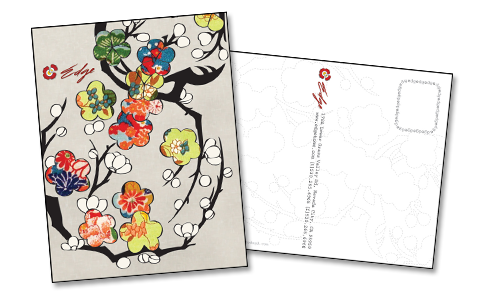 Edge has its own product designer who was able to provide inspiration in the form of Japanese prints and geometric sketches. The inspirational material was used to create fresh illustrations that framed sample material prints. 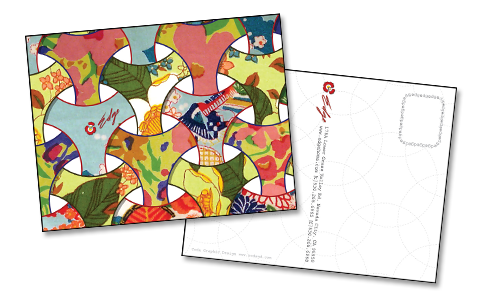 Each postcard incorporates three material prints in a manner that complimented the overall design. The framing illustrations are repeated in a transparent fashion on the back of the postcard. The postcards obviously meet USPS mailing rules.